Let’s imagine that you and I are engaged in a word association game, and I say “November.” What would be your response? Most likely, you would say “Thanksgiving” since that is the major November event. In November our thoughts naturally tend to be of that big holiday as we anticipate family, food, and fun. But there is another November holiday that is often overshadowed by Thanksgiving: Veterans Day. Signed into law as a legal holiday by President Woodrow Wilson in 1919, November 11th was first called Armistice Day. It was created to celebrate the armistice (truce) between Germany and the Allied nations which ended World War I. The armistice was signed at the 11th hour on the 11th day of the 11th month in 1918. In 1954 President Eisenhower and Congress changed the name to Veterans Day so that WWII and Korean Conflict veterans would also be honored. Today it is a holiday that honors all U. S. military personnel – past and present, active and inactive. Several years ago I was assigned a project that necessitated research on Hollywood stars who had served in the military during WWII. 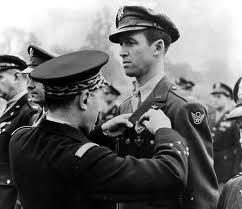 I was captivated by the military career of actor James “Jimmy” Stewart; it was almost a movie in itself. An early interest in flying led Stewart to gain his private and commercial pilot licenses in 1935 and 1938. By 1939, he had already accumulated over 400 hours of flying time and was considered a highly proficient pilot. He was the first Hollywood star to enlist in the military for WWII, joining nearly a year before Pearl Harbor. He was initially refused entry into the Army Air Corps because he weighed five pounds less than the 148-pound minimum requirement (what a problem!!). Stewart spent the next 3 months gobbling up milkshakes and fried chicken wings in preparation for a second physical (sigh!!). Still underweight by about one pound, he persuaded the doctor to look the other way and approve him. Upon enlistment his weekly pay dropped from about $6000 to $21, and he dutifully sent his Hollywood agent/manager the required 10 percent ($2.10) each week. Assigned to stateside non-life-threatening duties, Stewart repeatedly requested combat duty until he got it. His father was so emotionally distraught at the thought of telling his son goodbye as he departed for overseas combat duty that the elder Mr. Stewart instead wrote Jimmy a letter and enclosed a copy of Psalm 91. He urged his son to rely on its words for strength and protection. Jimmy carried the letter and scripture in his pocket throughout his European tour of duty, and it is interesting to note that on every mission where he was command leader, neither a plane nor a man was lost. Stewart’s war record included over 20 combat missions, and he rose to the rank of colonel—the highest ranking actor in military history with awards too numerous to mention. After the war, Stewart continued to play an active role in the U. S. Air Force Reserve, achieving the rank of Brigadier General in 1959. He retired in 1968 after 27 years of service. Stewart died in 1997, and his simple, flat grave marker bears only his name, birth and death dates, and this Bible verse: “For He shall give His angels charge over thee to keep thee in all thy ways” — a verse from Psalm 91. As we nestle into November and Thanksgiving, and we make a list of things for which we are thankful….be sure to include veterans. Their service has guaranteed the fact that we live in a free democracy. Take time to personally thank one (or more) for what they have done. Consider a visit to a VA hospital during the holidays; you will find more than one veteran who may be without family.